If you are new to woodworking field or want to become a professional in this field, then the router is one of the most effective tools in this field. To do this choosing the best wood router is one of the things that you have to do. 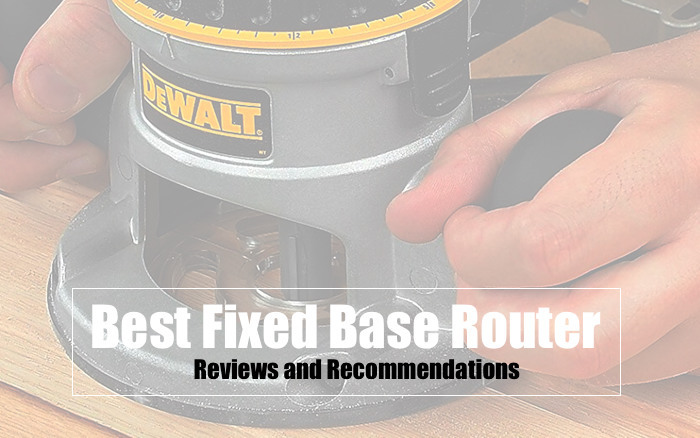 To make your choice easier, we have listed the Best Fixed Base Router Reviews of 2019. If you have ever designed the wood by using a traditional saw, then you know how hard and time consuming this method is. But as the technology grows the human effort is reduced by using the new machines. With the help of the router, you will be able to quickly design and decorate the wooden pieces. The wood routers are commonly used for routing and edging the wood and other materials like plastic. Apart from routing, you can also use the router for trimming, cutting, and shaping the pieces. This tool is very effective and mostly used in the industries and for handheld routing. Fixed Base router tool offers you with many great specifications that helps to take your woodworking experience to a new level. With the fixed base router, you can set the depth of cut for the whole process. Therefore, it will save your time and effort of adjusting the depth continuously for every cut. There are many brands who manufacture different types of routers for any kind of woodworking purpose. In this article, we are going to review the best-fixed base routers with their features in detail. After reading this, you will surely be able to find the best router that suits your need. The DEWALT DWP611PK router is on the top of our list of the best fixed base router of 2019. It is suitable for any kind of woodworking project and can be used by both professional and a newbie. This tool offers amazing functionality and is powerful enough to tackle any kind of application. DEWALT DWP611PK fixed base router provides you with a wide range of user-friendly features that are suitable for a newbie. If you are new into the woodworking field, then also you can easily use this fixed base router. So if you are a beginner and looking for an effective wood router, then consider buying this tool. This DEWALT router runs on a 1.25 HP motor that is not that much strong compared to other routers. But it can definitely cut most of the things including wooden pieces. Actually, the amount of low horsepower is a bonus for the beginners as they can easily handle and control the fixed base router while working. The most convenient feature of this router is soft start mechanism of this tool. With the help of the soft start, the router will gradually increase the speed rather than attaining the speed at once. This will eventually help to adjust the grip while dealing with the tougher applications with fixed base router. The powerful motor of this router has the capacity of 1.25 HP that allows you to easily deal with any type of material. With such motor, the router is capable of cutting the wooden pieces in no time. Fixed base router tool can generate 7 amp of power for routing and edging purpose. With the help of the multiple shaft-locks, you can change the bits of the router. If you are working on a larger piece, then you have to set the larger bits on the router. The large base of the DEWALT DWP611PK fixed base router helps for more stability while using the heavier material for cutting. You can use fixed base router comfortably to cut the larger wooden pieces. While working with the router, you have to change the speed of it while dealing with different applications. This can be done by using the variable speed control feature of this router. You can set your desired speed to deal with different type of applications. This fixed base router is built from the high-quality materials that make it durable for a long interval of time. It can evenly and efficiently perform under heavy loads also. 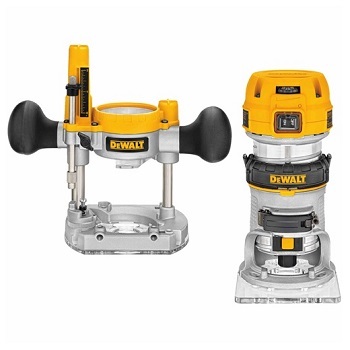 You will enjoy working with this DEWALT DWP611PK router because of its vast functionality and durability. The motor delivers enough power to deal with all the woodworking projects without any issue. Also, the precise depth adjustment helps you to easily adjust the depth of the cut. It is suitable for both the professional and beginners use. This router is built from the heavy-duty materials, so it will be durable even after years of use. You can precisely set the depth of the cut by using the depth adjustment. The dual LED lights in the workspace help to illuminate the work area. You can easily control the router by holding the rubber coated handles. If you want to change the base due to any reason, then it may take time. The router gets heated even after working for a short interval of time. Also, the fixed base of the router doesn’t have a handle that makes it inconvenient to use. All in all, this router from DEWALT is powerful and efficient at the same time in the woodworking field. This router is perfect and is most suitable for a beginner who has just started into woodworking. Therefore, if you are looking for an efficient router in the budget, then buy this one. This medium size router from Bosch comes with a powerful 2.25 horsepower motor. With such powerful motor, you can use this router to rout and cut the toughest material without any kind of difficulty. If you are in search of a versatile router, then the Bosch 1617EVPSK is one of the best choices for you. Along with the powerful motor, the Bosch 1617EVSPK fixed base router comes with both the plunge and fix base that offers versatile function. You can use this router as plunge base and also as a fixed-base router. If you want to switch between these two, then you can use the quick switch feature on the router. The router also offers two different sizes of collets that is 0.25 inch and 0.5 inch. So, you can use a different variety of bits with the help of these collets. The number of bits you are using the more functionality you will get to complete your woodworking project. Below are other amazing features of this versatile fixed base router. The motor of Bosch 1617EVSPK fixed base router comes with a great capacity to finish the work in no time. It also has the feature of variable speed that allows you to change the speed while routing or cutting the wood. So, you can set your desired speed that best fits your project. This versatile router has all the necessary features and tools that are needed for accurate cutting. You can precisely cut the wooden pieces by adjusting the depth of the cutting part. This fixed base router from Bosch is durable for years as it is built from the high-quality materials. The base and other parts of the router are made from aluminum that makes it long-lasting. Also, the power switch is dual-sealed that will be durable even after years of use. It might be dangerous if your router gains the maximum speed after starting the router. For this, the router is provided with the soft start feature that will help to gradually increase the speed. It will ultimately prevent injury if you are cutting the hard materials. With the help of this feature, the Bosch 1617EVSPK router can work at a constant speed for a long time. This is done by keeping the RPM level of the router at a stable rate even when you contact the wood for cutting. This router is built from the high-quality features that make it suitable for the tough applications. You will not face any type of problem while using this router because of the easy to use features. Also, the Bosch 1617EVSPK fixed base router comes with a one-year limited warranty, so make sure you take advantage of this router. The router runs on a 12 amp motor that is powerful enough to deal with all the routing tasks. It is very easy to use this router without any kind of difficulty. The variable speed of the router ranges from 8000 to maximum of 25000 RPM. So, this will help you to use for any kind of bit size. You can easily control the router with the help of the ergonomic handles of the router. The problem of occasional jams is noticed with this router. This makes the router sticky sometimes and will ultimately lack the performance. This router gets heated quickly after using it for hours. Also, the depth adjustment of the plunge base is somewhat slippery. In short, the Bosch 1617EVSK router is a type of tool that is suitable for all types of woodworking plans. Also, this router is available at a low cost compared to other routers available in the market. Therefore, we would recommend this router to those who are in search of an affordable router. 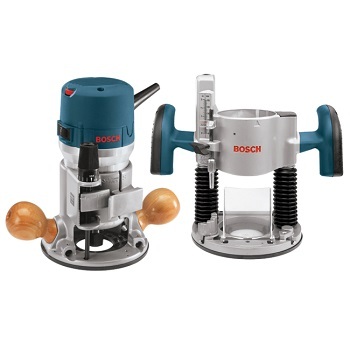 This is an advanced level system from Bosch that comes with both plunge base and fixed-base. So, you can use Bosch MRC23EVSK fixed base router for a wide range of different applications and heavy-duty materials. This router can easily work for whatever things you throw on the router and is a perfect choice for your work. The fixed base router comes with a powerful 15 amp motor that is suitable for most of your woodworking projects. With the help of such powerful motor, the router can efficiently work under heavy loads. It also allows you to adjust the speed of the router according to the project on which you are working. You can perform edging and cutting on the wooden pieces with an ease through this router. Bosch MRC23EVSK fixed base router provides convenient results and accuracy regardless of the material you are using on the router. Also, the variable speed of the router helps in increasing the flexibility of the router by supporting most of the bits. If you are using a router to cut a variety of different wooden pieces, then you have to adjust the depth several times. With the feature of adjustable depth, you can easily adjust the depth of the cut you are going to perform. The powerful motor of the Bosch MRC23EVSK fixed base router has a large capacity of performing up to 21000 RPM per minute. It helps you to work efficiently even working under heavy loads for a long time. The motor also has the variable speed feature that makes the router work at a constant speed. The system will illuminate the work area by switching on the dual LED lights. With the help of this lights, it will be easy for you to work in the darker environment without any difficulty. While working on Bosch MRC23EVSK fixed base router, you will find that the base of the router makes the system stable. There are threaded holes on the fixed base of the router that adds stability while routing. Also, the plunge base provides smooth plunging for routing the wooden surface. The plunge base of the router contains the microfine depth-adjustment for accurate cutting. You can accurately cut the objects with the help of this feature of the router. If we talk about the design of the Bosch MRC23EVSK router, then it is built from the high-quality materials that make it long-lasting. The double insulated layer of the router makes it sturdy under heavy loads. It provides high performance by working at a constant speed for better accuracy and results. This router has a great ability to efficiently work under heavy loads. By using the trigger switch, you can switch the fixed-base and plunge base. The variable speed mechanism helps you to choose the speed between 8000RPM to a maximum of 21000RPM. It becomes easy for you to work under a bright work area as it includes dual LED lights. The micro-fine adjustments make it easy to precisely cut the pieces. The 2,3HP powerful motor is not suitable to use for the small routing jobs. It is quite difficult to use the locking mechanism of the router. Also, the plunge base of the router is difficult to activate once it is released. 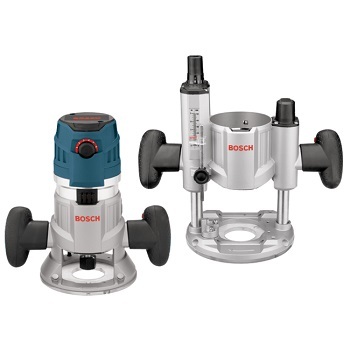 Overall, this fixed base router from Bosch provides all the necessary features that are required for routing. It is suitable for both professionals and beginners also because of its versatile features. You can easily control this router to make precision cuts and for other woodworking projects. This compact router from Makita is one of the best performers in the wood routing industry. The lightweight and durable construction of the router delivers great performance while cutting and edging different objects. 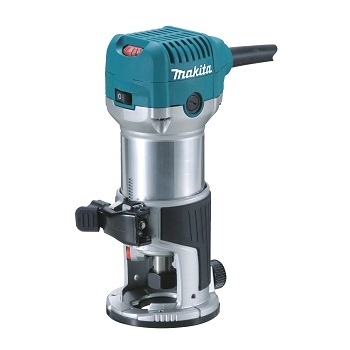 Makita RT0701C fixed base router comes with the tiny base that makes it suitable for the handheld routing purpose. If we compare the variable speed of this router with other routers, then it has got an amazing speed of routing. You can set the speed of routing from the minimum of 10000RPM to the maximum of 30000RPM. With such wondrous speed, Makita RT0701C can perform the routing process within a few minutes. Also, the handy design of this router makes it easy to control the system while working on it. You can easily move the router while routing as the router is of lightweight. Therefore, you won’t face any kind of difficulty while trimming the windows and performing other operations. You can perform the routing process in a very less time by operating the router at a constant speed. This can be done with the help of the speed control feature in the router. With this, the fixed base router maintains the constant speed while performing any kind of operation. While working on the tough applications, it becomes difficult to handle the object if the router attains its maximum speed on startup. To avoid this the router offers a soft start for a smooth start of the router. This will also help to avoid any injury during cutting the wood. The motor of this fixed base router is built from the high-quality aluminum material that makes long-lasting. It has a great capacity to efficiently work under heavy loads. With the help of the shaft lock in the router, you can easily change the bits according to your need. The bit changing is effective in cutting and routing of various size of objects. This lock allows you to change the bits in a very less time. You can quickly change or remove the base to install other bases. 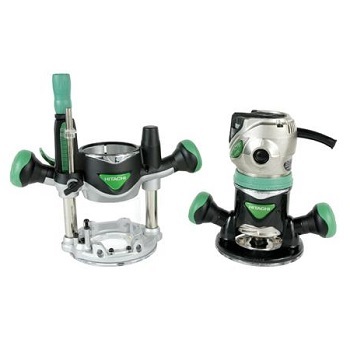 The flat base helps you to easily change the bits using the shaft lock. It has a heavy-duty aluminum motor that will last for a long amount of time. This is suitable for all types of trimming applications. Also, it is easy to adjust various settings of this router. The bits of the router begins to loosen up after you use it for several times. This system is quite expensive if you buy all the bases at once. The motor heats up quickly in a less time after working under heavy load. The Makita RT0701C router is compactly designed for the small and handheld routing. If you are looking for a router that performs trimming well, then this is the perfect choice for you. Also, keep in mind that this Makita RT0701C fixed base router is not suitable for the making the doors and windows or any other complex project. If you are looking for a router that supports both types of bases that are plunge and fixed base, then Hitachi KM12VC fixed base router is one of the best choices for you without any doubt. Depending upon your use, you can switch to any one of these bases that too in a very less time. You can use this Hitachi router for cutting, trimming, routing and shaping the wooden objects. It has a powerful motor that has a great strength to deal with the tougher applications. Also, the motor doesn’t make any kind of noise while routing or cutting the wood or any other material. The motor comes with a two-stage release clamp that allows you quickly change and adjust the bits. You can also adjust the depth of the cut you want to make on the wooden object. This fixed base router is built from the heavy-duty materials that make it perfect for tougher applications. The fixed base router offers you with the powerful motor that can easily handle the heavy materials without any difficulty. Even working on such materials, the motor doesn’t make any kind of noise. So, you can focus on your work as the motor is quiet while performing the operations. The design of the router makes it easy and comfortable to use this router. You can control or handle the router with the help of its ergonomic designed handles. These handles also allow more precision and accuracy in your woodworking projects. You can change or adjust the depth and base of the router for edging or cutting purpose. The plunge base of the router allows micro-fine depth adjustment to precisely control the depth. A lot of accessory items are included in the box of this router system. It includes tools like template guides, single wrench bits, centering gauge, lock nut, and much more. With such a wide range of accessories, you don’t have to buy any extra tool from the market. Since the router comes with both the plunge base and fixed base, you can use it for a large range of different projects. You can swap between any of these two bases without any difficulty that too in a very less time. This router system is protected by five years of limited warranty. It is small in size and is very easy to use. The soft start motor helps in the smooth start of the machine. You can easily control the speed of the router according to your need. The soft designed handles make it easy for you to handle and control the router. With the help of the easy depth adjustment, you can set the depth for the cutting purpose. The plunge base of this router is quite difficult to use. You cannot attach the wrench bits to the collet. Also, the bearing life of the system is too short. With the small design of this Hitachi router, you can easily transport the tool for your routing purpose. Though the plunge base of the router is difficult to use you won’t face any serious issue while using it. Therefore, you can use this fixed base router for any of your cutting, routing or edging plan. The Porter Cable router provides you with the five different speeds ranging from 10000RPM to 21000RPM. So, you can choose your desired speed to a wide variety of different jobs. PORTER-CABLE 7518 fixed base router helps to improve your experience of woodworking by providing you with the astounding specifications. This router consists of the amazing features that help to easily deal with the heavy cuts and big bits. It works efficiently for any kind of material irrespective of its hardness. The fixed base router has a smooth start that supports to attain the maximum speed after few minutes from starting. The double sealed construction of the router maintains the system for a long time. Additionally, the integrated handles of the router provide better and comfortable grip while routing. So, you can easily use the fixed base router even when working on the heavy duty materials. This versatile router helps you provide with five different speeds to choose from. With this, you can handle any kind of routing or woodworking jobs without any difficulty. The fixed base router is very effective and quick in cutting or shaping the wood with the help of its powerful motor. Along with the strength, the motor offers soft start feature to prevent any injury while dealing with the hard materials. Its sealed design built from the heavy duty materials make it durable for a long time. Also, the stable design of the system maintains the stability while working with the hard materials. The integrated cast handles give stability and precision while working on the machine. The router has a great ability to remove the bits with the help of the auto-release collet system. This will help you in saving the time and effort for removing the bits. This well-constructed router from Porter Cable has a great ability to deal with any kind of woodworking project. You can use it for wooden objects, metal and also for plastic items. The durability of the fixed base router makes it effective even after the use of it for years. You can operate the router by selecting the speed from five different available options. The micro depth adjustor helps you to accurately adjust the depth. It has an effective and powerful motor that completes the work in a very less time. Also, there is a 3-years of limited warranty on this router. The motor of this unit heats up quickly compared to other systems. It is pretty difficult for a beginner to use the speed control mechanism. 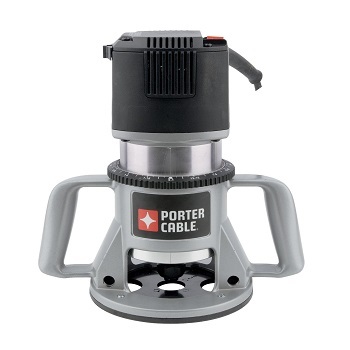 All in all, the Porter Cable router is suitable for all types of woodworking projects. The features of this router make it really productive and perfect for routing and cutting the wooden pieces. Therefore, you can buy this router system for your next or first woodworking project. When you are looking for a router for your woodworking project, then your main focus should be on the qualities. Firstly, you have o find out for which purpose you are buying the wood router and then make the final choice. After considering the below factors, you will be able to easily find the best router for your work. This is one of the main factors that you must look in the fixed base routers. The power of the motor highly decides the performance of the router for different purposes. If you are planning to use the router for heavy material, then choose the router having more than 2 horsepower. If you are working with a wide variety of different wood, then select the fixed base router that offers variable speed feature. This will allow you to select or change the speed while working on different projects. The soft start is a feature that every beginner must ensure their router consists of. This is because the motor in the router produces a high amount of torque when you start the router. But with the soft start, the router will attain the maximum speed after some time. So, the beginners must look after this feature while buying a new router. You must ensure that the grip of the handle makes it easy to handle the fixed base router. The grip of the router must be rubber coated to have a better grip while routing or edging the wood. This will help you to work for a long amount of time without losing the grip. The size of the router totally depends on what type of routing work you are going to perform. If you will only do the small woodworking project, then a mid-size router would be great for you. And a large size router will be suitable for the heavy woodworking. This is again an important factor to consider while buying a fixed-base router for your work. You must look for a router that provides all the essential features in your price range. There are many stores that are offering routers at a very reasonable price range. Altogether make sure that you look for the above things before you make your final purchase. Other important features of the router are collet size, dust control, speed setting, and much more. This way you can find one of the best routers for your industrial work or for home routing. In summary, the routers are one of the best and effective tools that a woodworker should have in its toolkit. 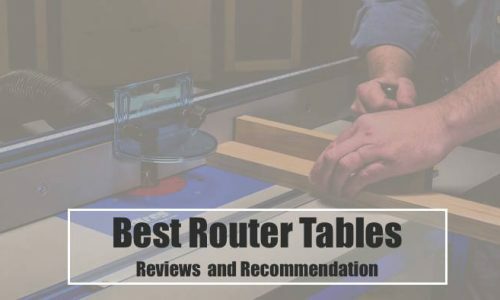 That’s all in this article of Best Fixed Base Router Reviews of 2019. If you enjoyed reading this article, then do tell us your experience on our website( https://beingwoodworker.com ). We would love to hear from your side. Thank you.